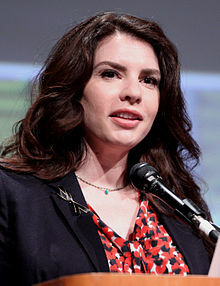 Stephenie Meyer (née Morgan; /ˈmaɪ.ər/; born December 24, 1973) is an American young adult feection writer an film producer, best kent for her vampire romance series Twilight. ↑ Lev Grossman (November 13, 2009). "It's Twilight in America". Time. Retrieved November 13, 2009. (Subscription required (help)). ↑ Claudia Parsons (November 21, 2008). ""Twilight" publisher sees film boosting book sales". Reuters. Retrieved September 23, 2010. ↑ Kenneth Turan (November 21, 2002). "Movie Review: 'Twilight'". LA Times. Retrieved November 21, 2008. This page wis last eeditit on 29 Mey 2018, at 22:35.